Bodybilt Conference and Training Room Chairs set the ergonomic standards for conference chair manufacturing. That is why we rely on Bodybilt performance, comfort and durability; and have for 14 years. BodyBilt's conference and training room chairs are an ideal solution for environments requiring comfort for hours on end. When it comes to ergonomic comfort, conference and training rooms are often the most neglected areas of the office. The captive audiences in these areas often find themselves anxious to cut their meetings short, simply to escape the back pain and discomfort of poorly-designed seating. BodyBilt has created a line of chairs that combines the pressure-reducing seat contours of our standard seating collections with ergonomic adjustability that is ideal for conference and training room settings. 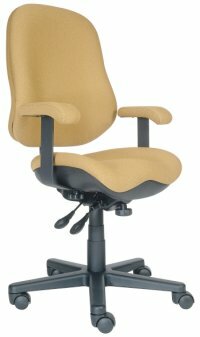 BodyBilt seat and backrest contours work with our unique Posture Control system to reduce seated pressure by dispersing the user's weight over more surface area than other chairs, thus reducing seated pressure (psi). It's easy to understand the importance of being comfortable when you're trying to absorb a maximum amount of information, whether it's during a training session for new employees, or a high-level board meeting around the conference table. Use the following form to begin configuring the Conference/Training chair which best meets your needs. Once you have made the selections below, click the "Continue Configuration" button which will take you to a page where you will select specific upholstery color and other available options.